Put your shovel away and eliminate the cloud of ash it produces! Dustless Ash Vacs make cleaning ash fast, clean and safe. These patented systems are the best selling ash removal system for more than 20 years. Shovels can create a cloud of ash that settles everywhere and leaves your house smelling like an ashtray. Using a household, or shop vacuums, can be extremely dangerous because of warm embers hidden in piles of ash. Ash acts like an insulator, hiding and protecting embers that can stay hot days after you think the fire is out. Dustless Ash Vacs are designed specifically for cleaning warm and cool ash out of fireplaces, wood stoves and pellet stoves. 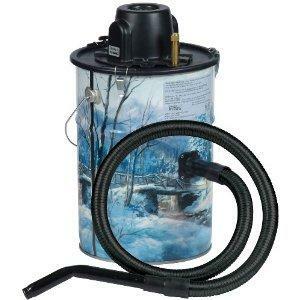 They feature a steel nozzle with a 5-foot flame-resistant hose and a fireproof 3-gallon steel chamber. The patented filter system uses fire-resistant fabric rated up to 1,200° F, and the remaining parts are all made out of thermo-plastics to withstand high temperatures. The filters are designed to capture extra fine ash particles, and when it comes time to clean them, you can do it without opening the canister. Simply jiggle the agitator rod to knock ash off the primary filter. as well as pellet and corn burning stoves. Love-less Ash Company History Out of the rural, coal-mining town of Price, Utah, Love-Less Ash Company was founded in July of 1988. Mike Loveless invented the original Ash Vacuum in 1983 because his wife, Colleen, had had it with the dust that was associated with their wood stove. The original ash vacuum was used for 5 years in their home while friends and family wanted one just like it. Finally, they ventured into the business of manufacturing ash vacuums for resale and did it in a one-car garage. Mike handled all research and development while Colleen handled the business end of things. Mike received his first patent in 1989, his second in 1993, his third in 1997 and his 4th in 1999. The first Ash Vacuums produced, were attachments to another vacuum source. They had a fire retardant filter and the customer’s home vacuum acted as the second filter. The original vacuums were well received but some stove owners needed time to get used to the concept of VACUUMING the ash from their stoves. It had not been successfully done before this time. In 1990, a motorized unit was introduced and was exactly what the public wanted. The Cheetah was introduced and has been modified to be the Cheetah II. It is now the standard size for ease and convenience in the market place. The Cougar was introduced in 1999 and is also a quiet version of the Cheetah II. In April of 1997, a second specialty vacuum was introduced to market. This was a 16 gallon "Dustless" Wet/Dry & Drywall Vacuum. It had been on the drawing board for 3-4 years. Wet/Dry & Drywall Vacuums will handle the very fine dust such as sheet rock and sanded concrete dust and the consumer can change from dry to wet and back to dry applications without changing the filters and still maintain great suction. The 16002 was introduced in 1998 and the "Quiet" 16004 QV hit the market in 1999. The Turbo Drywall Sander was introduced to market in November of 2000. It was 3 years in the making. This new tool is revolutionizing – sanding drywall. This sander is powered by the suction of our drywall vac. The head vibrates to do the sanding for you while the tube draws the dust right into the vacuum. The remodeling industry has been asking for a product like this for years and we are pleased to have it available. Now a totally "dust free" solution to a very messy job. The company has changed its manufacturing facility three times. It moved from a one-car garage to a new and larger shop, to the facility it is in presently.